Livability.com has ranked the top 10 cities for foodies in a recent issue, and there are a few surprises on the list! Most notably, sitting pretty at #2 is a little place called Omaha, Nebraska. Supporting local farmers, showcasing regional cuisine, and eclectic, innovative eateries all aided in the selection process. Awards won and Michelin stars were taken into consideration, and the only Coral Gables, FL outranked us this year. With a continued focus on Farm to Table, sustainability, and clever cuisine, Omaha has once again shown itself to be a big player in foodie culture. Fox & Hound in Omaha is teaming up with ALS in the Heartland to support individuals living with amyotrophic lateral sclerosis. The bar and grill will donate 10% of all sales on Thursday, July 16 to ALS in the Heartland, which provides free services and support to ALS patients, their families, and caregivers throughout Nebraska and Western Iowa. Come enjoy $2 draft beer, signature cocktails, Black Forest Sliders, and a night out for a great cause. No ice bucket required! 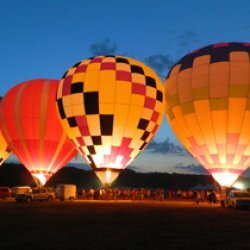 The 9th annual Nebraska Balloon and Wine Festival will be taking place on August 7 and 8 at the scenic Coventry campus just south of 204 and Q. Advance general admission tickets range in price from $9 to $14, the latter including 5 tastings of beer and wine of your choice. Ponies, helicopter flights, and 2 days of food make this event fun for the whole family, while the backdrop of a beautiful Nebraska day, a romantic ride in a balloon, and wine from dozens of local vendors will make this a date you’ll never forget! Tickets are $17 at the door, so go to http://www.showofficeonline.com/NebraskaWineBalloonFestival.html to learn more and order tickets!